In today’s post, Technology Integration Coach, Kelly Moore, reflects on the development and expansion of HSE21. Kelly specializes in helping teachers to integrate digital tools for learning in meaningful, appropriate ways. Teaching and learning are at the core of HSE21 – modern technologies are one tool that foster the principles on which HSE21 is based. Since HSE21 first emerged several years ago, and as it continues to develop, the reach and scope of the program continues to expand. For the 2015-16 school year, the program has grown from grades 5 & 6 into grades 7-12. Over 12,877 students in grades 5-12 are now learning with 1:1 technologies. Students in grades 5-8 will utilize iPads, while students in grades 9-12 will learn using a device of their choice under a Bring Your Own Device program. In addition, 23 K-4 iPad pilot teachers, are using iPad carts to enhance their students’ learning experiences with HSE21 tenets. 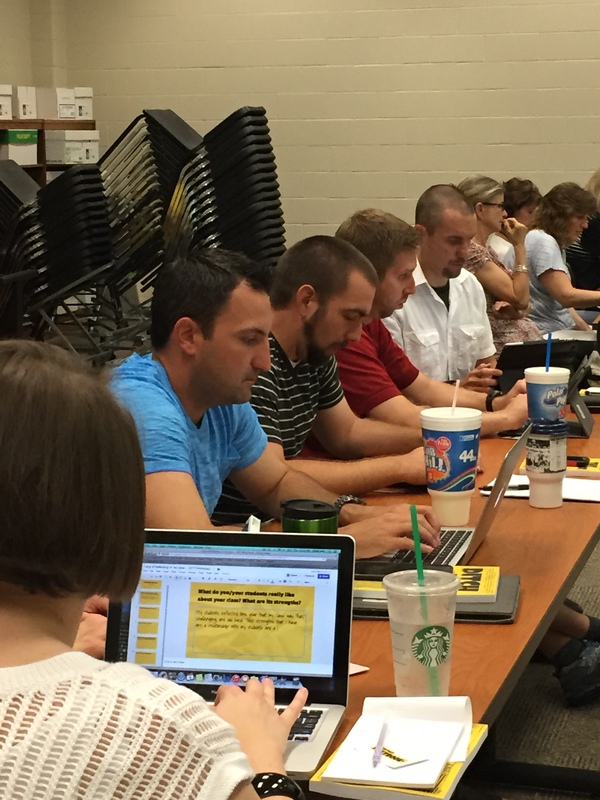 An Indiana Department of Education Digital Learning Grant, awarded in 2014, has allowed for additional HSE21 professional development for our teachers. This is not only technology-focused up-skilling, but also a zeroing-in on changing classrooms. Professional Development focuses on shifting instruction from traditional teaching methods to student-centered problem solving in blended learning environments. Best Practice is consistently infused in PD as teachers proceed along their personal instructional technology continuum. Curating and developing digital content is ongoing, and our teachers are increasingly integrating digital content and using Blackboard, our Learning Management System. In June, our Summer Learning Fair was a highly successful three-day event. Over 80 HSE21-focused sessions were attended by over 330 teachers with a total of 1970 training hours! As HSE21 extends its reach, its vision remains steadfast! HSE21 will equip students with the content knowledge, unique skills, and new literacies they will need to contribute positively in their communities and success in the 21st-century global economy. Click here to learn more about HSE21 by visiting the website!